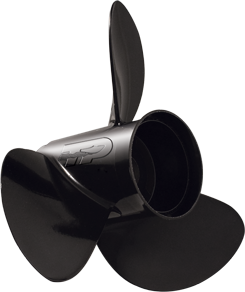 Hustler Aluminum boat propellers are available in 3 or 4 blade, right and left rotation for 6-420+ hp engines. Hub kit is not included and is sold separately. only does top speed, handling and hole shot improve, but also mid-range performance, which will save you a ton in gas usage. Higher rake angles tighten the vortex produced by the propellers, plus aggrssive rake and cupping add to boat lift, handling and overall performance. Turning Point Exclusive process is used to manufacture all Hustler aluminum propellers. Squeeze Casting generates the highest mechanical properties attainable in a cast aluminum prop resulting from a tighter grain structure. Stiffer blades means less flex and a faster prop. Competitors still use old Die- Casting processes that produce blades that flex, resulting in overall poor performance.